Dental restorations or fillings have revolutionised over the last couple of years.Dental material suppliers are racing to sell the latest and most technologically advanced material to dental professionals.And we are spoilt for choice. I have 2 main things to consider when deciding on what material to use.One is the superiority of the quality of these dental material, and ther other is their cost.Logically and undoubtedly the higher the quality,the more pricey there are. 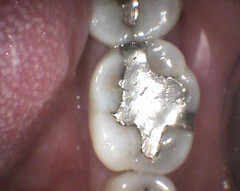 Very soon after I started my practice,I made the decision to not do amalgam fillings on my patients’ teeth.It was really quite a matter-of-fact kind of decision.There is so much hype globally about the questionable safety of dental amalgams,even though there is really no concrete proof to say that amalgams are toxic just because they contain mercury.I like to look at aesthetically pleasing things and naturally I want to be able to produce aesthetic dental fillings,besides making sure they are placed well and allow normal function.The tooth -coloured material available in the market are constantly being researched and improved upon.With that,I decided to have an amalgam-free practice. 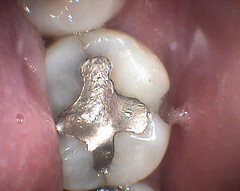 These are a few pictures I took of my patient who had very old amalgam fillings and they were either already leaking at the margins or there were potential leakages.I replaced the amalgams with tooth-coloured high-impact composite filling material, and you can see that there really is a great difference in how they look.I use 3M-Espe composites,which I find to be superior compared to many others.They are probably the most researched dental materials currently.Of course,composites are bonded to the teeth and more operator-sensitive,which means I have to be very careful and confident in placing the fillings to prevent microleakages and to allow them to stay functional in the mouth for a substantial amount of time. The last tooth has a sagittal fracture. 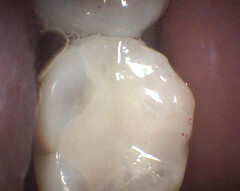 I wouldn’t be surprised if you saw the lines on the mesial and distal marginal ridges connect along the pulpal floor. Hopefully the pulp will remain ok for a while with the new bonded filling. 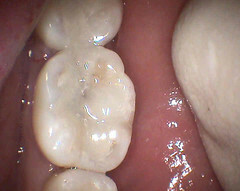 Coloured tooth fillings are the way to go, its defintely a lot better looking than the usual greyish, silverish colour.